Our system is implemented in almost every possible market types; each with its unique configuration and challenges. AVPM® is proud to offer an all-in-one solution that can grow as your business expands. We offer many types of software and hardware to accommodate your operations. 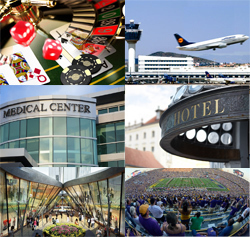 Whether you run an airport, a stadium, hospital, shipping center, casino or resort hotel, we will work with you to design and implement a successful system for your location specific needs. Our team of technicians will train and give you proper support overcoming any obstacle faced.